New Orleans Police are investigating a fatal shooting on Broadway Street that occurred today (Tuesday, Sept. 4). 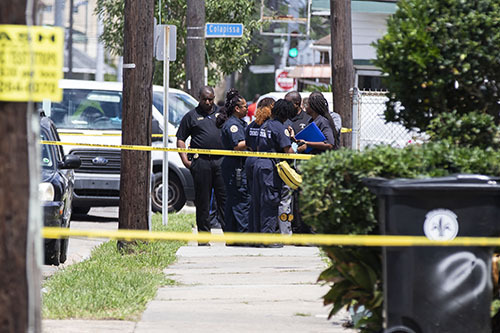 The shooting, now designated a homicide, was reported in the 3000 block of Broadway (between Fig and Colapissa streets), NOPD Officer Juan Barnes Sr. said. According to reports, Second District officers were dispatched to the 3000 block of Broadway Street to a call of an aggravated battery by shooting around 12:18 p.m. Upon arrival, they found a 25-year-old male lying face up in the grass, in front of a residence. The victim was suffering from multiple gunshot wounds to the head and body. He was soon after pronounced dead on the scene by EMS, via a medical doctor. If you have any information regarding this incident, please contact Homicide Detective Theo Kent at 504-658-5300. Citizens with information that can help solve crimes are asked to call Crimestoppers at 504-822-1111 or toll-free 1-877-903-STOP.